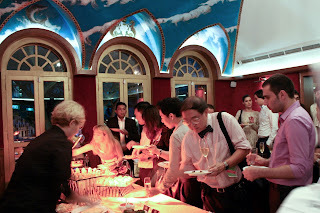 Buyan, a russian restaurant and caviar bar (located at 9/10 Duxton Hill, Singapore 089593. Tel: 62237008) recently launched a wine club within its premises. This new club is named Vinolyub. I attended the launch on the evening of 13 mar. Impressively done I must add :) Suffice to say it was well attended by guests and those in the local wine industry. The event provided a good opportunity to catch up with old friends, meet new ones and have a look at Buyan's setup. Indra Kumar (a certified sommelier and certified specialist of wine) takes care of wine concerns in this establishment, and there's an impressive collection for him to take care of I have to add. The food section is helmed by chef Sasha Kutuzova who pleasantly teased our taste buds for the evening. Both showed their mettle during the launch by charming guests with a good selection of wines and food dishes. An efficient team of support staff ensured the smooth running of this event. It was an evening with lots of energy, happy folks, smiling faces and warm company. I have to compliment the team for hosting a great evening. Crystal Wines held its Italian & Spanish Wine fair on 10 mar 2012. I attended one of its tasting sessions Saturday afternoon with some friends with a view to boosting my personal wine reserve. Purchasing wines at a decent discount is always a good motivation. 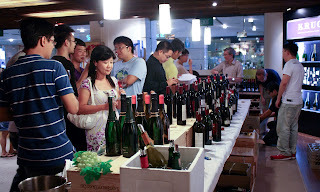 Furthermore this fair held a tasting of 20 wines, giving enthusiasts as opportunity to taste before purchase. Here’s some feedback from my wine buddies regarding the wines offered for tasting. The favoured value for money deal acknowledged by most was the Castellblanch Gold Brut Cava NV. A sparkling wine from Spain, it went at a discounted price of $20. It makes a good match for food with light to medium body weight. Be it a sip for a hot afternoon with sandwiches, an aperitif before dinner, an accompaniment for starters like salads and soups, or to pair with seafood dishes, dim sum or even a steam boat meal, this bubby offers a versatile option. Two reds were noted for being easy on the palate and approachable to drink at this moment. They are the 2004 Marques De Caceres Reserva Red (discounted price $46.40) and the 2009 Talenti Rosso Di Montalcino (discounted price $37.50). Those who had a preference for Italian wines went for Veneto’s 2008 Nicolis Seccal Valpolicella DOC Classico Superiore Ripasso for its supple body and generous flavours (discounted price $45.60). Another sought after red was the 2008 Tenuta San Guido Guidalberto (partly for its affiliation with Sassicaia I suspect; at a discounted price $63.75). The latter is slightly closed at the moment and would do well if given an opportunity to gain some age. A little patience will benefit this purchase. 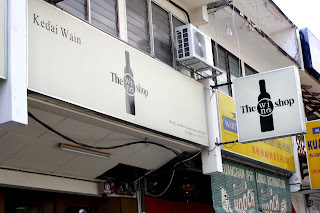 Visiting Penang and looking for places to buy wine? I just did that a couple of weeks ago. An opportunity came to spend a few days in Penang early February. It was a revisit to the island after 3 years, for the sole pleasure of reacquainting myself with the local cuisine over there. Fortunately this time round, I had the company of a good friend (Markus) who grew up there to play host and guide. Aaron (of The Wine Unplugged) joined me for this trip. Mornings were spent checking out local eateries; most were family-owned and with their trade passed down from one generation to the next. Since this trip fell near the end of the '15-days period' of Chinese New Year, evening dinners were spent at Chinese restaurants with local oenophiles who were passionate about food, wine and the thirst to celebrate life in the company of family and friends. Located along a row of shophouses, this company occupies 2 units; one unit functions as a retail outfit while the other unit next door serves as a wine bar with a selection of light food to go with your preferred sip. All types of wine from bubblies, still dry to stickies can be found here. Wines retailed come both from the new and old worlds with a good spread of wines from France, Italy and Australia. On a smaller scale wines from countries like US, Spain and NZ can be found as well. Price per bottle range from as low as M$100 to a few bottles priced above M$1,500. Unless you are looking for that special award winning bottle from a highly sought after label which thrives on small production, most other wines are retailed at fairly affordable prices. We bought a few whites to start dinners with and some reds for the later part of the evenings. 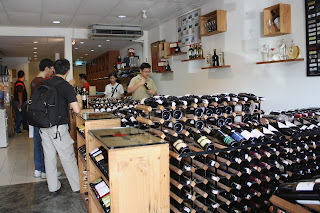 The owner is Mr Jack Tan who is a collector, connoisseur and purveyor of good wines in Penang. I met him during my first wine dinner there and we had the opportunity to do another dinner with him during this trip. Suffice to say he introduced some interesting French, Italian and Aussie reds during the 2 dinners from his cellar. He has been investing and collecting wine for some years now, and has an impressive portfolio. If you are seeking well known champagnes or quality still wines to enjoy with your friends, he just may be the person to talk to. 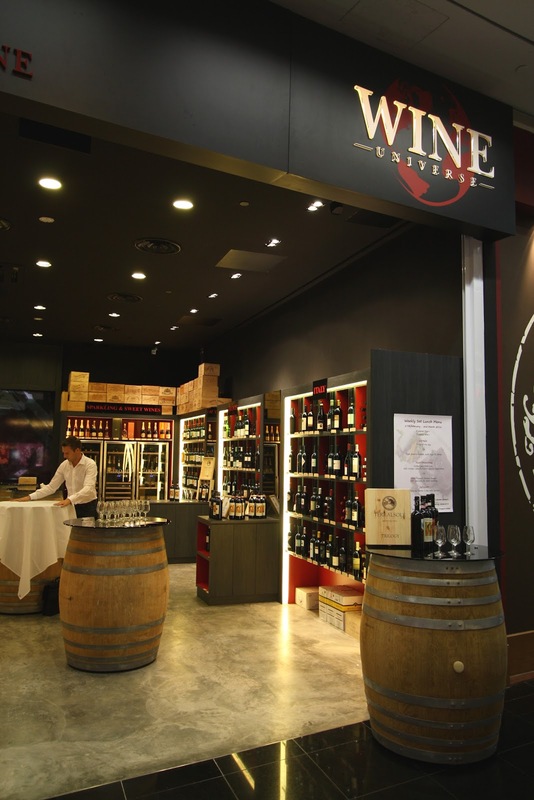 Wine Universe recently opened a new wine retail outlet. Its located at 9 Raffles Boulevard, #01-107, just adjoining its existing restaurant (Oenotheque by Wine Universe). It commenced operation a month ago. 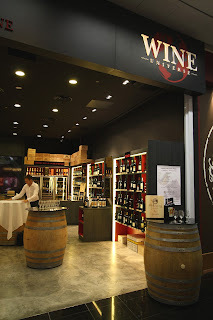 Since this new shop was holding the Terralsole wine tasting yesterday, I took the opportunity to attend the tasting and at the same time have a look at its liquid wares. Mr Axel Paquette is the wine shop manager and he was kind enough to take the time to speak about the wines retailed here. This shop carries wines from France, Italy, Switzerland, Spain, Australia and a few Hungarian Tokaji wines too. Three reasons tempt me to come to this shop for future purchases. Wines from Switzerland. Its comforting to taste highly rated or award winning wines, or those that come from well known wineries and famous winemakers. For me personally its comforting but not exciting nonetheless. I get more joy and excitement in trying wines from lesser known regions and new wineries, in tasting wines from places not strongly represented in Singapore and wines made from varietals I have not as yet had the opportunity to taste. Wines from Switzerland are not strongly represented in Singapore, yet. They tend to suffer the same predicament here as wines from East Europe and to a lesser extent wines from Austria. This shop holds a good number of wines from Switzerland, especially from the Valais region. One reason is due to the fact that one of the partners in this company is a Swiss vintner himself. I see myself going here to make purchases of these Swiss wines for the simple pursuit of tasting and exploring some new sips. Wines from Italy. This shop carries the known wares from Barolo, Barbaresco and Tuscany, both from recognized producers and some small houses. But what caught my attention is the single varietal red wine made from Corvina. You seldom see it being retailed as a single varietal red wine in Singapore. (Corvina is one of the grape varietals used in the making of red wines from Valpolicella. Most wine enthusiasts will be familiar with wines from the Valpolicella region via the well known Amarones). Italian whites retailed here come in the form of gavi and arneis from Piedmont, and an interesting bottle of Vermentino (a DOCG white) from Sardinia as well. There are also a few red wines from the Puglia region worth checking out if you are curious about wines from the southern part of Italy. Hungarian Tokaji wines. I saw Aszu wines and a Aszu-Essencia as well. I am quite happy with the sweet ones from Hungary as an alternative for an evening to those from France, Germany or Canada. (Thankfully Hungarian sweet wines are more easily available these days in a couple of established wine retail outlets in Singapore).